My tastes have changed since I started blogging about tacos in 2005. The other night I was doing some blog clean up and deleting spam comments that had piled up and I read some of my old reviews. Well I couldn’t disagree with myself more. Who is this idiot that thinks King Taco is the best taco in LA? Oh right! That was me! I guess it’s worth mentioning that before I started this blog I didn’t really know anything about tacos, and I still don’t have the sort of knowledge that I could be called any kind of taco expert. I’m just a kid from the Westside with a dream, and a car that gets pretty good gas mileage. Sure I’ve picked up some knowledge on the way but I’ve probably learned more about myself during my taco odyssey than I have about tacos. Sergio’s isn’t very big inside. There are many 6 tables and they are almost always taken. In fact I always order my tacos to go but on a paper plate and I end up eating them on the hood of my car in the parking lot. 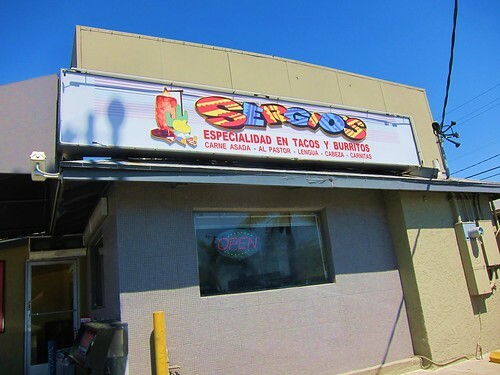 Every time I’ve been to Sergio’s I’ve placed my order with the taquero. Once he hears your order he places the meats you ordered on his wood cutting board and chops fresh meat on to the tortillas and then looks up and asks “spicy?” . Of course I always respond in the affirmative. This time I ordered the trifecta ; carnitas, carne asada, al pastor. The carnitas was standard carnitas, nothing special. It had it’s crunchy bits and it’s moist bits but there wasn’t that flavor that rendered fat gives that one expects with great carnitas. It was also the least compatible taco with the spicy salsa. The al pastor and carne asada however did not disappoint. The al pastor is cut from the spit then griddled with onions until it has a charred taste. A squirt of lime and a shot of the red chile completes the taco . 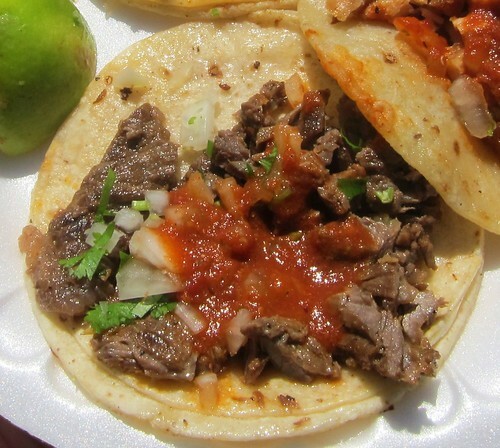 But the classic LA taco here is the carne asada which is tender, juicy, dense cuts of ranchera steak topped with raw onions, cilantro and red chile salsa . It’s flavor , it’s heat, it’s simplicity. It’s a great taco. Yes when I go back and read some of my old posts sometimes I do end up disagreeing with myself. But when it comes to Sergio’s the consensus (with myself) is clear. These are some of LA’s best tacos. "I’m just a kid from the Westside with a dream, and a car that gets pretty good gas mileage. Sure I’ve picked up some knowledge on the way but I’ve probably learned more about myself during my taco odyssey than I have about tacos." Once again the literary in you rears its baby-head. It's probably time to think about a book of your taco journey. No, seriously. The Lengua Tacos are the best. (Yes tonque) The meat is fresh and tender. 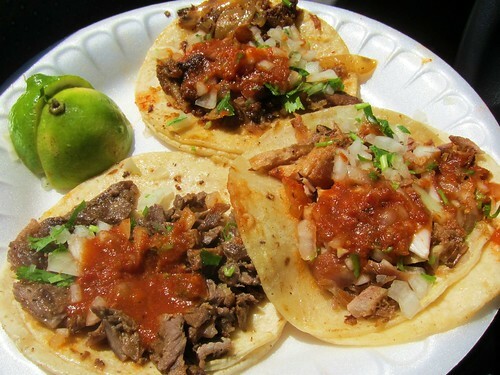 anonymous, yeah I should start ordering lengua again. I had some real funky lengua not long ago and I haven't ordered it since. My fav taco spot in all of LA also (only places in Mexico City, Guadalajara & Cuernavaca compare). good but the tostadas - worth the drive.